Tregillis, Ian. Bitter Seeds . Tor 2010. Comments: Trilogy and related shorter works, including "What Doctor Gottlieb Saw", Bitter Seeds , "What Doctor Ivanovich Saw", The Coldest War , and Necessary Evil . Tregillis, Ian. 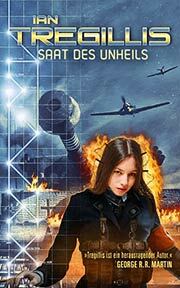 "What Doctor Gottlieb Saw"
Summary: Set about 20 years before the events of the first novel in the series, providing background on the children manipulated by a German physician to manifest paranormal powers. Series note: Prequel to the Milkweed Triptych. Published: Posted on-line at Tor Books in June 2010. Tregillis, Ian. 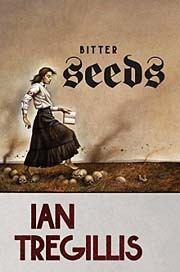 Bitter Seeds . Orbit UK 2012. Tregillis, Ian. 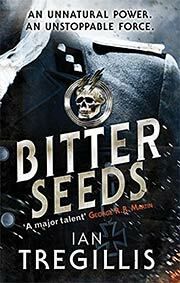 Bitter Seeds , translated to the German as Saat des Unheils . Deltus 2014. Summary: In 1940, Britain suffers disastrous losses at Dunkirk due to Nazis exploiting paranormal agents and prepares for invasion as the RAF is overwhelmed. The tide is turned as British warlocks call on dark powers to destroy the invasion fleet and then to aid a Soviet attack on Germany in spring 1941. Series note: First book of the Milkweed Triptych. Published: Tor 2010 (0765321505BUY), 2012 (0765361205BUY); Orbit UK 2012 (0356501698BUY). Translation: Czech by Pavel Bakic as Horka setba , Argo 2015 (9788025716458). Translation: German by Christian Jentzsch as Saat des Unheils , Deltus 2014 (9783940626158). Translation: Latvian by Evita Bekmane as Rugtas skelas , Prometejs 2013 (9789934842207). Translation: Polish by Robert Lipski as Mroczna geneza , MAG 2013 (9788374803816). Translation: Spanish by Gabriel Dols Gallardo as Semillas amargas , Random 2013 (9788415725039). Tregillis, Ian. "What Doctor Ivanovich Saw"
Series note: Interstitial story in the Milkweed Triptych between the first and second novels. 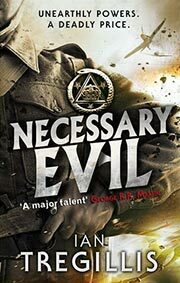 Published: Posted on-line at Subterranean Press, Fall 2013. Tregillis, Ian. The Coldest War . Tor 2012. Tregillis, Ian. 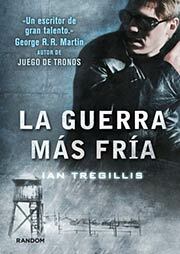 The Coldest War , translated to the Spanish as La guerra más fría . Random 2013. Summary: In 1963, Britain contends against a Soviet Russia that controls the entire continent and had obtained Germany's paranormal secrets. But more serious is that the dark powers exploited by the British warlocks are preparing to crush humanity, and the only one with a plan to fight them is a German clairvoyant. Series note: Second book of the Milkweed Triptych. Published: Tor 2012 (0765321513BUY), 2013 (0765335387BUY); Orbit UK 2013 (0356501701BUY). Translation: German by Christian Jentzsch as Der kälteste Krieg , Deltus 2014 (9783940626196). Translation: Latvian by Evita Bekmane as Visaukstakais kars , Prometejs 2014 (9789934842238). Translation: Spanish by Manu Viciano as La guerra más fría , Random 2013 (9788415725091). 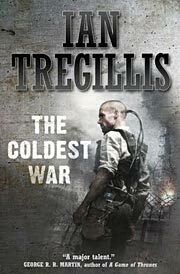 Tregillis, Ian. Necessary Evil . Orbit UK 2013. Summary: A time traveler returns to 1940 with plans to avert the dire events of 1963 by detroying both the NazI paranormal program and the British warlocks. Series note: Third book of the Milkweed Triptych. Comments: This volume of the trilogy is only allohistorical where it references events in the prior volumes, as the traveler's effort is to create our own history. Published: Tor 2013 (0765321521BUY), Orbit UK 2013 (035650171XBUY).